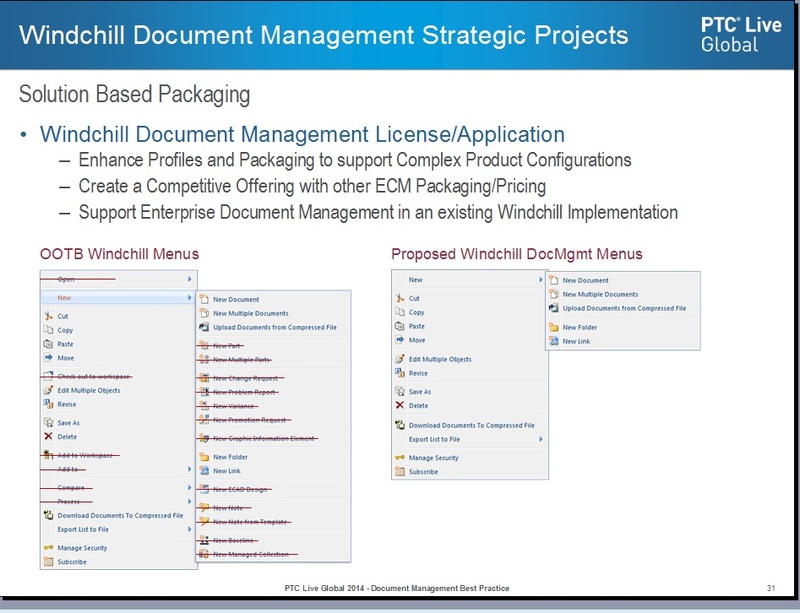 Can you teach me where is the file to customize the menu in winchill and how? Take a look at "profiles". These will allow you to hide many of the different actions. You can then assign these profiles to different users/groups. Profiles define what parts of the user interface (for example, actions, tabs, and attributes) should be visible to a participant. By associating participants with profiles, the user interface reflects the settings in the profile for that participant. By defining a profile that exposes only the necessary functionality and information needed by a user, it creates a focused and simplified user interface, reducing confusion by eliminating areas that could be distracting. This capability allows your site to ensure that a supplier, customer, or group of users is presented with a streamlined and focused set of information and actions. Each user or group can be associated with one or more profiles. The least restrictive settings for visibility are assumed. For example, if a user is associated with two profiles where one profile hides an action, but another profile allows visibility of that action, then the user will see the action. If one profile allows read only visibility to an attribute, but another profile gives full rights to that same attribute, then the user will have full rights to the attribute. Changes that are made to profiles take effect after the user subsequently logs into the system. 1. I create a profile name "test user" and check/uncheck some action name. 2. I create a user name "test" add the "test user" profile. When I log as a test user, why I can't view anything?